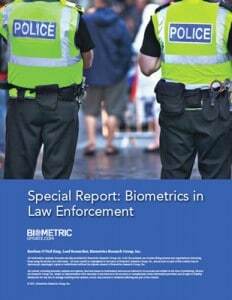 This white paper by Biometrics Research Group, Inc. provides an overview of the law enforcement biometrics market (PDF). Law enforcement biometrics refers to applications of biometric systems which aids policing. Biometrics Research Group Inc. projects that the global law enforcement biometrics market will grow to US$18 billion by 2020 from its 2015 value of US$7.5 billion. The law enforcement market includes the use of biometrics to identify or verify the identity of individuals who have been: apprehended or incarcerated because of criminal activity, suspected of criminal activity, or whose movement is restricted as a result of criminal activity. Biometrics may be used to identify non-cooperative or unknown subjects, to ensure that the correct inmates are released, or to verify that users under home arrest are in compliance. The wide-ranging “law enforcement biometrics category” includes automated fingerprint identification and recognition, mobile biometrics identification devices, criminal ID solutions, as well as access control systems. Our Special Reports are sponsored by leading firms within the biometrics sector and this report is sponsored by Cognitec, Crossmatch, Allevate, JENETRIC and World Border Security Congress.